INBUILT SCRIPTING LANGUAGE - simplexnumericas Webseite! 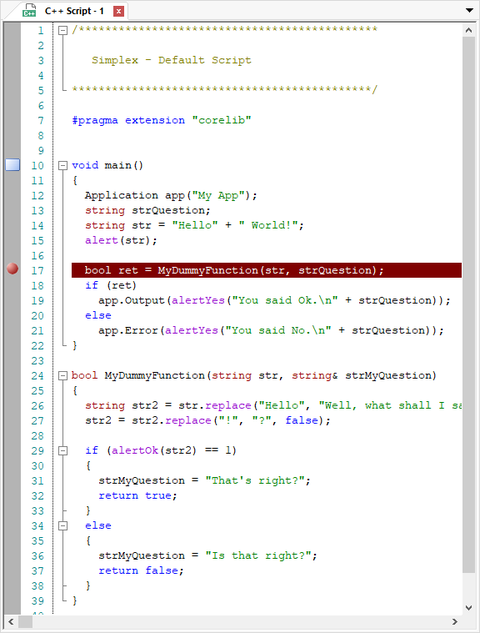 The scripting language inside SimplexNumerica is called AngelScript. It is made by the famous Andreas Jönsson. AngelScript is a scripting language with a syntax that is very similar to C++. It is a strictly typed language with many of the types being the same as in C++. AngelScript is an extremely flexible cross-platform scripting library designed to allow applications to extend their functionality through external scripts. It has been designed from the beginning to be an easy to use component, both for the application programmer and the script writer. AngelScript features static typing, object handles (similar to C++ pointers but garbage collected via reference counting), object-orientation, single inheritance, multiple inheritance with interfaces. Allows operators to be registered and overloaded. Please have a look to the Programming Manual here!